The Black Wall is an reasonable (compared to some recent developments on the Port Hills) little crag of relatively good rock and moderate climbs. So far there are about 32 routes up to 15m high and Grade 25.While the rock is generally better than nearby Farm Park often the top few metres of the cliff are of unstable blocks topped by steep grass consequently climbs may finish a bit short. The crag is sheltered from the easterlies more than Farm Park and quite cool in summer. Most routes have double bolt belays with chain. While it must have been known about in the early days it was left alone until Bill McLeod and Simon Middlemass moved around from Farm Park on an exploratory wander. They climbed Liaisons Dangereux (15) and Principal (20) that visit. Mere days later the Athol Whimp and Gavin Tweedie team visited disillusioned with Farm Park and climbed the same natural lines thinking they were first ascents - Athol's Die Yuppie Die being only a slightly different line to Principal. They returned with Pete Sykes to bolt several other routes on the main wall before Pete left for Dunedin. It lay unvisited for several years while most of the original ascentionists were elsewhere. 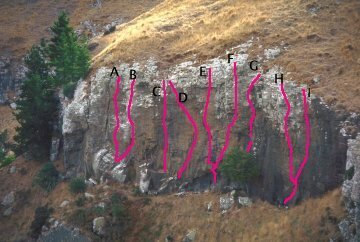 Simon harboured this as a secret crag while living in Wanaka and revisited on returning to Christchurch checking out lines and drilling the holes for If Jenny Craig could see me now. Hearing that Lindsay was writing a Port Hills Guide and checking out all the crags plus a desire to keep the Chain Link gangs out Simon headed back in January 1998 with Pat Deavoll. Finding lunch scraps and chalked holds one day and the discovery of Craig and Tony a few days later - (also surprised to see others there) led to a frenzy of climbing. After that more and more people turned up and it was unlikely to remain under wraps much longer. Most of the old routes were rebolted at this time. From the Farm Park car park above Taylors Mistake cross the road as for Farm Park [towards Lyttelton] to the Crater Rim track but instead of dropping down the other side follow the track up the hill. Just below the steps sidle left across an old slip until you find another fence. Follow this fence straight down the hill until the fence drops off right towards a small bay. Head down here or alternatively crossing the fence at the flax bushes and will put you at the top of the crag . Once you are at the top of the crag, an easy access gully/ stepped rocks drops to the base of the crag, between the Main Wall and the Little Cliffs on the right side. Carry on leftwards around the base of the Main Wall to the South/West Side.